Pink peonies for sale from Fina Gardens. Pink peonies for every garden. 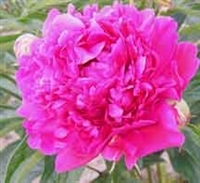 Tall, strong growing peony with impressive double blooms of rose to deep lilac pink in color. This unique, elegant double bomb features big mounds of petals suffused in white, cream and yellow, then intermingled with touches of raspberry pink. The flowers have good substance and are borne up well on long 36-inch stems. This peony features medium to large hot pink, double blooms that open in midseason. It is, indeed, a super peony. A peony of elegant, understated form with soft, cerise pink blooms. Among the best pink flowered singles, this peony is a vigorous grower. The Japanese form flowers feature medium pink guard petals surrounding a center of buff-yellow staminodes usually interspersed with pink petaloids. Great Lady is a very early blooming deep pink single peony. A striking pink Japanese form lactiflora. This peony hass soft pink guard petals that surround a center filled with more soft pink ruffled petals encircled by yellow petaloides. Provides the early peony garden with some of the first double deep pink peonies. A bright, medium-pink Japanese form peony, this peony will really bring a shot of color to the garden landscape. Another great choice for rock gardens or front of borders. Bring a little fun along with beauty into the garden with this peony. This single form peony features large, simple bright fuchsia petals accented by raspberry flares at their base. This pink double flowered peony really extends the late bloom season.